Hitecastro are proud to present our DC focus controller, HitecDCFocus. We beleive we have produced the finest digital DC focus controller available. HitecDCFocus is specially designed and extensively tested to support both the 'Skywatcher' and 'JMI' focus motors. Sockets for both types of motors are standardised on the high quality CNC machined housing. 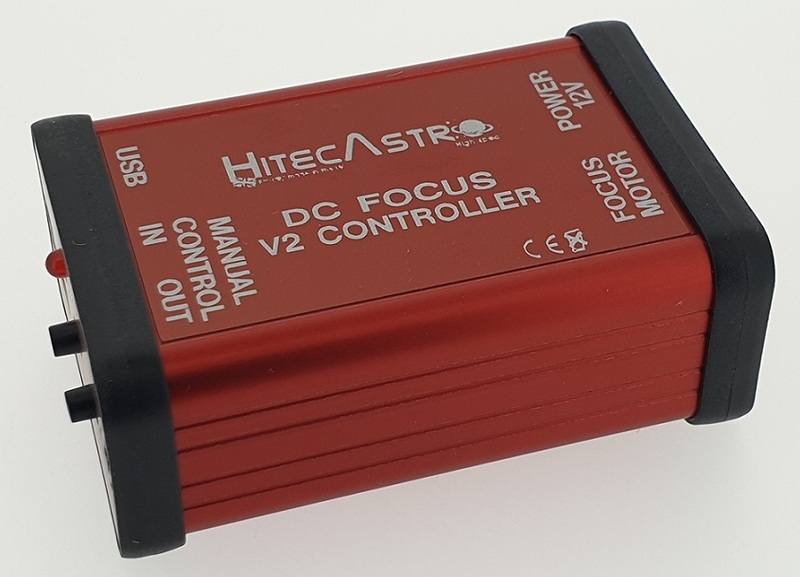 Additionally we have included manual focus buttons so you can use your HitecDCFocus unit, even when its not connected to a PC. 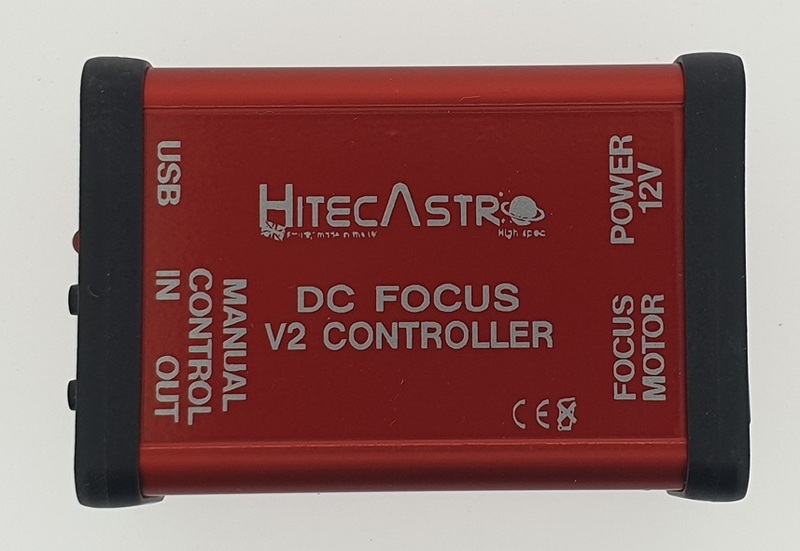 PLEASE NOTE CONTROLLERS LABELLED DCFOCUS2 ARE MEANT TO BE USED AS A SECOND UNIT IN CONJUNCTION WITH ANOTHER DCFOCUS CONTROLLER. 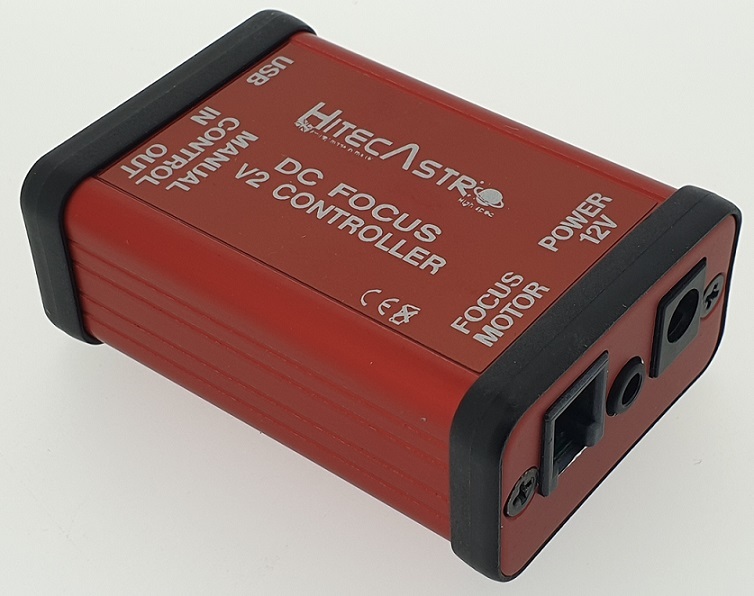 IT IS THE SAME IN EVERY RESPECT AS DCFOCUS CONTROLLER EXCEPT IT HAS A DIFFERENT USB IDENTIFIER SO IT CAN BE USED ALONGSIDE AN ORIGINAL CONTROLLER. Of course, it is when connected to a PC via USB2.0 that HitecDCFocus comes into its own. Our specially written software provides exquisite control over your focus motor. The minutest of focus motion can be acheived by adjusting the parameters of our software to your needs. Everything from the speed of the focuser to the frequency the motor operates at can be controlled. We have developed a 'simulated' step mode which emulates a stepper based control in function. It should be clearly noted that all DC motors are NOT capable of repeated absolute positioning. Unlike stepper motors which can be commanded to move a fixed number of steps, DC motors can only be turned on and off for a period of time. This limits the use for autofocusing. We have however tested this with autofocus software and gotten very good results. If the highest level of autofocus is what you want we recommend our range of stepper motor based controllers. We think planetary imagers will be particularly interested in this focuser since anyone who has tried to focus on planets at high magnifications will know that even touching the telescope to focus at very high magnification can cause impossible shaking of the image on screen. By reducing the speed of the focuser and adjusting the frequency of the motor to suit your setup you can acheive vibration free focusing even at the highest of f/d ratios. HitecDCFocus is currently available from our dealers. For software downloads, user manuals and ascom driver etc please see our support page.